OSWEGO, NY – Former Frederick Leighton Elementary School teacher Norma Barnes returned to present the â€œ4 Love of Readingâ€ awards to fourth graders. 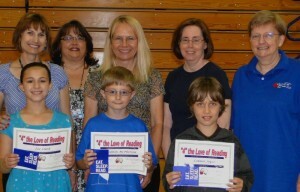 "4 Love of Readingâ€ awards presented. She instituted the award several years ago when she was named Wal-Mart Teacher of the Year and, with cooperation from Bill Reilly from the riverâ€™s end bookstore, recognizes fourth graders. This yearâ€™s recipients were Zoe Clark, Benjamin McPherson and Conner Joyce. In back are teacher Teresa Korbesmeyer, Principal Julie Burger, teachers Mary Ann VanBrocklin and Terri Fear along with Mrs. Barnes.